2nd December is Small Business Saturday, and although that focuses on indepedent high street shops, I thought I’d look at all small businesses which I’ve interacted with this year, either as a customer, as a freelancer, who I’ve delivered training to, who I’ve met networking, or on social media. Here are the second set of 5 businesses I’m featuring (if you want to read the first blog in the series, it’s here) The first two ladies are based in Leek. I met them both when I presented some social media training for the Leek Wire networking group. Liz and Mike opened eRa of Leek this summer. It’s a lifestyle store with eclectic, rustic and artisan (eRa – see what they did there?) furniture and home accessories. Liz took me on a virtual tour of the shop on Facebook Messenger video and I was wowed by the range of products they have lovingly restored or sourced from small designer/makers on their travels. What sets this shop apart from other independent homeware stores on the UK high Street? 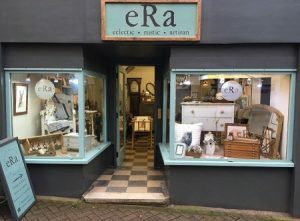 Items are unique to eRa, the stock is turned over and new items appear, you’ll hardly see the same things twice, unless it’s a range of cards or candles from local suppliers, in which instance those products are exclusive to eRa. Apart from one off pieces of furniture (which Mike restores and upgrades in his workshop) Liz sells ceramics, lithographic prints, beauty products, hard-woven willow, limited edition prints, and soft furnishings. Liz and Mike are curators of lots of lovely things in one inspiring location, at very reasonable prices. If you have two left hands and prefer to leave the painting to the professionals, Helen regularly exhibits her upcycled wares at craft fairs. This week she has been selling handmade Christmas cards, hand-painted coasters, candlesticks, and gorgeous bottles with teeny lights inside. Even in the background when I video-called Helen, there’s a ladder… “oh it’s a little something I’m making into a towel rail!” Is there no end to her creativity? And there’s more, Helen sells French Chic paint (a creamy, no odour/toxins/VOCs, child and pet safe paint) in two outlet concessions; The Alphabet Store, Leek and Hartington Farm Shop and Cafe. If you’ve ever met Sarah Cross, you will know the passion she has for organic farming and organic produce. I heard her talk at a Wire meeting on an organic farm earlier this year and I was completely transfixed listening to all the info. I learned about the antibiotics that are pumped into the food chain and how this is dealt with differently with organic produce. It’s really fascinating to know more about the food we eat, as it has an impact on our bodies that we don’t realise at the time. So, since then, I’ve been ordering chicken, pork and lamb from Sarah in batch and freezing it. 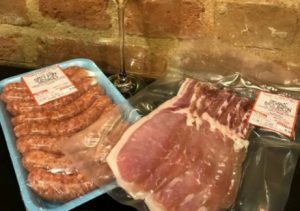 She hand makes her own sausages from pork shoulder and gluten free rice flakes, and her bacon is preservative free. Prices are very reasonable compared to all the usual organic shopping options out there. My christmas turkey is from… you guessed it! Sarah runs monthly market stalls in Belper, Bakewell, and she delivers pre-ordered goods to Buxton and Macclesfield too. 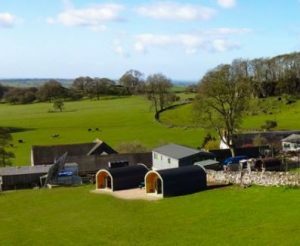 Multiple award-winning business couple Felicity and David Brown run a holiday cabin and glamping pod business on their farm in rural Derbyshire. They have many USPs to the business, guests can take their horses on holiday (which rest in their well equipped stables), less able guests can stay in wheelchair-friendly log cabins with comfort and style and those wanting to escape city life can sleep under the stars in the glamping ‘pods’ which have a view of fields from the bed! I’ve had the pleasure of working alongside Felicity and David on a few areas of their marketing, they’re a force to be reckoned with, and I’ve blogged before about how they’re ticking all the right social media boxes. Next weekend will be our first visit to Hoe Grange Holidays, I’ve booked us in for a 2 night glamping pod stay, so check the SME Touchpoints Facebook page and Instagram for updates on the fun times! I just LOVE these little balls of light, and I want to buy them for every room of my home! Brighton based businesses Cable & Cotton have a store in ‘The Lanes’ got in touch with me to discuss ways to boost their affiliate marketing and we scheduled a Skype chat to run through lots of ways to encourage bloggers and affiliate sites to drive more sales. 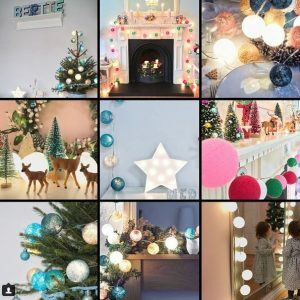 It was a really interesting chat, and now I’m hooked on the brand and the products, esepcially at this time of the year where they can be used for Christmas decorations (switched off in the day) or gentle lighting in the evening.